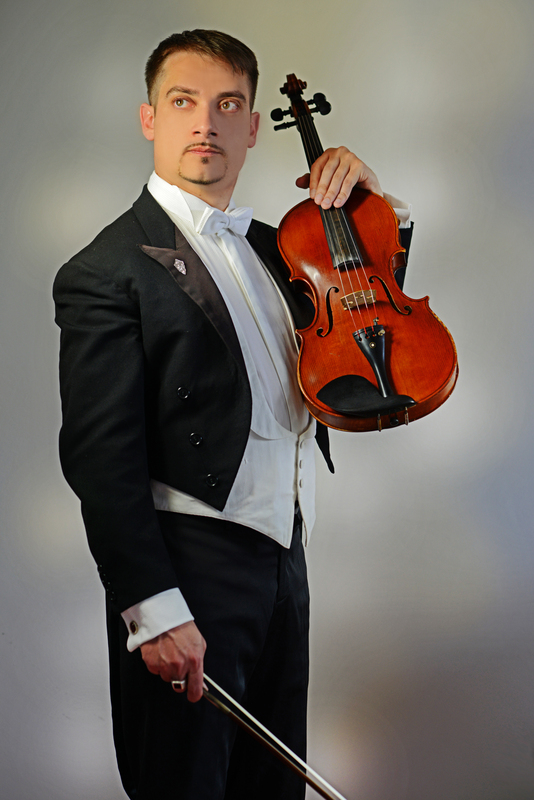 Born in 1984, at the only age of fifteen, Marco Misciagna achieved his Diploma in violin and then in viola with full marks at the State Conservatory of Music “N. Piccinni” in Bari. He subsequently obtained his Diploma with distinction at “Santa Cecilia Academy” in Rome. Recognized as one of the best students of the Conservatory, he was invited to the Quirinal Palace in Rome by the Ex-President of the Italian Republic Ciampi. Considered as one of the most virtuous and talented artist of his generation, he continued his development under the guidance of C.Romano and D.Trkulja (ex first violin of the famous Zagreb Quartet) and the great violist Michel Kugel. Chosen by M° Boris Belkin and M° Yuri Bashmet, he perfected his skills following the International Courses at the Chigiana Academy of Music in Siena, where he was awarded two Honour Diplomas and won the Prize “Monte dei Paschi di Siena” twice, as best violinist and best viola player in the school (actually the first time in the history of the Academy). He continued further study at the “W.Stauffer” Academy in Cremona with Salvatore Accardo and at the “Fiesole School of Music” with P.Vernikov. In 1999 he won the First Prize for young talented musicians “M.Benvenuti” of Vittorio Veneto and he was invited to take part in the Moscow international N.Paganini violin Competition where he was the only Italian member who had the great opportunity to play in the concert halls of the prestigious Moscow State Conservatory. He has pursued a brilliant career as a soloist, performing with several national and international orchestra, winning great popular and critical acclaim. He played "The four Seasons" by A.Vivaldi, the Concerts for viola by Telemann, Bach, Handel, Rolla, Stamitz and Hoffmeister, "Rondò in A-Dur D438" by F.Schubert, the Symphonie Concertante K364 by W.A.Mozart for violin and viola, the Concert n. 2 "La Campanella", the "Carnevale di Venezia" and the "Sonata per la Grand' Viola" by N.Paganini, the Concert n.1 in F sharp minor by H.Wieniawski, the "Tzigane" by Ravel, the Concert in D-Dur op.35 by Tchaikowsky, the Concert op.77 by Brahms, "Zigeunerweisen" op.20 by Sarasate, the Concert op.14 by S.Barber, the Concert for viola by W.Walton. He recorded a CD produced by Dynamic label, supported by the Lions Club (recordings of live performances of Wieniawski “Mazurke” for violin and piano, N.Paganini “Duo Merveille” for violin solo, H.W.Ernst “The last rose in the summer” for violin solo): the proceeds from the sale of the cds went to charity in order to help for the built of a centre for childhood. He played chamber music with several ensembles like the Ensemble Meditèrranèe, Hipponion Ensemble, Ensemble 2 Agosto, Quatuor Abime, Ensemble Oscar Niemeyer, Kissar Ensemble with musicians such as Antony Pay, F.Petracchi, M.Caroli, A.Markov, N.Lomeiko, U.Ghi, R.Giordano, M.Wolf, M.Sirbu, R.Bahrami, V.Zubitsky and many others. He recorded with the labels DAD-Records, Phoenix Classics, Terramiamusic, DigressioneContemplattiva. Some of his violin revisions were published by the publishing house Berben and he published his viola solo arrangements for Partitura Verlag. He was for years Principal Viola Soloist of String Orchestra in Malaga (Spain) with whom he recorded for Deutsche Grammophon together with the legendary guitar quartet “Los Romeros”. He performed in the most famous concert halls of Europe such as the Berliner Philarmonie, Essen Philarmonie, Hamburg Laieszahalle, Mannheim Rosengarten, the Meistersingerhalle Nurimberg, the Prinzeregententheatre of Munich, Arriaga Theatre in Bilbao, Victoria Eugenia Theatre in San Sebastian, Sala Sinopoli Auditorium Parco della musica of Rome and in the most prestigious halls of America such as the Balboa Theatre in San Diego – California, the Fox Tucson Theatre, S. Francis Auditorium in Santa Fe – New Mexico, the C.W.Eiseman Center, the Rudder Theatre, the Empire Theatre in Texas, the American Theatre in Hampton – Virginia, the Lehman Center and Carnegie Hall of New York and many others. He has been invited to teach Master Classes at the “Real Conservatorio Superior Reina Sofia” in Madrid, at the “Royal Irish Academy of Music” in Dublin, at Istanbul University State Conservatory and Hacettepe University Ankara State Conservatory (Turkey) and in other important academies. His repertoire includes his arrangements\transcription and pieces for solo viola which has never been played before, such as M.Vieux, M.Anzoletti, Casimir Ney, A.Rolla, H.Von Steiner, Hermann, as well as Bach, Telemann, Biber, Hindemith and many others. He was Professor of violin and viola at the Italian Conservatory in Paris and Hight School of Music and Arts IMEP of Namur (Belgium). In January 2014 the Belgian Government, through the Ministry of Higher Education, Scientific Research and International Relations, appointed Marco Misciagna "highest repute artist". He is member of Artistic Advisory Board (strings tutor, trainer, leader and concertmaster) of the Youth Philharmonic International Orchestra (a Project of Turken Foundation) based in New York and Honorary Artist of the Arkhangelsk State Chamber Orchestra (Russia). Actually he is Professor of viola at the Superior State Conservatory "Gesualdo da Venosa" of Potenza (Italy), Honorary Professor at “Institut Superieur de Musique de Sousse (Université de Sousse, Tunisia), Honorary Professor at Yerevan Komitas State Conservatory (Armenia) and Honorary Professor at the “S.Rachmaninov” State Conservatory (Tambov-Russia) and Far Eastern State Academy of Art (Vladivostok- Russia).